Richard is remembered on the war memorial at St. Matthew’s Church, Ipswich. Born: 8th September 1882, Zion’s Hill, Fincastle, Virginia, U.S.A.
Baptised: 5th August 1888, Boyton, Suffolk. Died: 26th July 1915; age 33; KiA. Enlistment Location: Ipswich; date: September 1914. Rank: Private; Service Number: 15245. 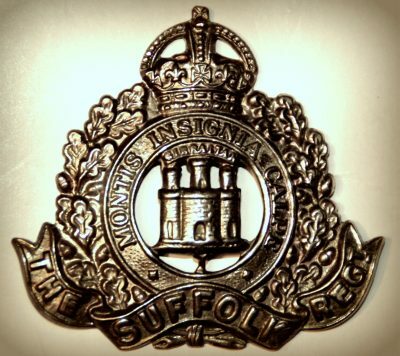 Regiment: Suffolk Regiment, 2nd Battalion, ‘A’ Coy. Buried at Spoilbank between Lankhop Chateau and Chester Farm. Relatives Notified & Address: Son of Alice Ling (formerly Miller), of Butley High Corner, Tunstall, Suffolk & the late Horace Miller. 1901 High Grange, Newton Cap, Durham. Richard was 19 years old, a Clothier Assistant. He was living with his mother, step father and step father’s children & grandchildren. Harry Rust Ling, 51, a Colliery Night Overman – Below Ground, born Hunwick, Durham. Alice Ling (nee May), 45, born Butley, Suffolk. John Thomas Ling, 24, a Colliery Night Overman – Below Ground, born High Grange, Durham. Harry Rust Ling, 16, a Pony Driver – Coalmine, born High Grange. Edward Ling, 14, born High Grange. Eva Ling, 9, born High Grange. Bertie Ling, 8, born High Grange. Richard was 28, a Domestic Gardener. He was living with his mother & step father. Harry, 61, a Retired Coal Mine Official. Richard’s father was Horace Edward Miller, born 1856, Boyton, Suffolk. On the 1st June 1880, he was recorded on the census at Fincastle, Botetourt, Virginia as a Farmer. He & Alice had 3 children born in England – Millicent, William & Horace & 1 son Hamile born in Fincastle. Richard was educated at Haverstock Hill School, London. Soldiers’ Effects to Alice Ling – mother. Suffolk Regiment, 2nd Battalion, ‘A’ Coy.